No monthly fees - affordable solution for all seo agencies. You need to run manually in order to check rankings. If you want to save 100s of dollars for keyword tracking, then this is what you need to grab! As an online entrepreneur, you want your page to get on top of the list of every search engine. You hire a web developer, a web design company and an SEO team to make sure that you will reach the top. Though you have hired the best web developing, web design and SEO teams, they don’t guarantee you that your page will reach the highest ranking. You will only know it if you search your page in every search engine. But you don’t have to do that anymore. There are several software programs that let you track the ranking of your website. One of this software is the Ezee Rank Tracker. The Ezee Rank Tracker is an SERP type of software. This type tracks the ranking of their website in every search engine. You just have to type your targeted keywords and it will give the website’s rank in the search engine. With this software, you don’t need to visit a search engine and see if your site is on top of the ranking. This software is ideal for any person who works in the online industry.The software program updates them on the latest ranking of their website. It also has several benefits to offer. But it has disadvantages, as well. But before we discuss the software’s pros and cons, let’s discuss how they handle their customers whenever they have questions about the product or they have some problems with the software. The Ezee Rank Tracker software has one of the most reliable and friendliest support teams. Their support staff is ready to give their hand when a person needs it. Once you have contacted them through Skype or through their website chat, they will answer your questions in an instant. You don’t have to wait for a day or two just to know the answers to your questions. If you have problems with the product, they will help you find a solution to solve it. In just a few hours, you won’t experience that problem anymore as they have already fixed it. The Ezee Rank Tracker offers several benefits to the users of this software. First, this software offers a lifetime edition of the Ezee Rank Tracker. When we say lifetime edition, you only have to pay once to get their unlimited service. Furthermore, this edition has no keyword limits. You can search for targeted keywords as much as you want. Second, this software gives fast, efficient and correct ranking results. Once you have typed your targeted keywords, it will give you the ranking with just a blink of an eye. You don’t have to wait for minutes and search page after page to see the position of your website. The software also updates you if there is a change in ranking. It will send you an email to update you on the latest ranking of your webpage. Hence, you will know when it is time to update your page’s content. But the greatest benefit of this software is that it lets you add more keywords and projects to your existing tasks. With this software, you can track if there is an improvement in the ranking of your page if you added more projects or if it stays the same. The Ezee Rank Tracker may seem a perfect choice for online workers because of a number of benefits that it gives to the users. But just like any product, this software program still has some flaws. One of the setbacks is that your software is vulnerable to hackers, despite having a passcode. Though you can get and change the password whenever you want, someone can still duplicate the program, especially if that someone is an expert hacker. Not giving a discount is another disadvantage of the product. Normally, new products give a discount and other gimmicks to entice the people to buy their product. But this software doesn’t give a discount, coupon codes or anything that will help you save cash. For them, giving a 100% satisfaction guarantee is enough to encourage the people to buy the software. Also, you need to buy proxies before you can use the software. It doesn’t have built-in proxies, unlike other tracking software programs that you can buy online. Having said those things, it just simply indicates that this is not a practical choice, especially if you are on a tight budget and looking for an SERP software that gives fast and exact results. Regardless of the setbacks mentioned above, the Ezee Rank Tracker is still one of the highly recommended software programs for SEOs, Webmasters, and other online professions. With this software, you can track your website easily. You will get updates on the latest movement on the ranking of your webpage. You don’t have to know your ranking by looking at the search engine pages one by one. Once you have typed your targeted keywords, the software will give you the results within seconds. As for the price, there is no doubt that it is pretty expensive compared to other rank tracker programs. Despite having a high price, it will help you save cash in a long run since you don’t have to pay monthly just to use the service. You only have to pay once and you can enjoy the benefits that it gives. The final verdict? 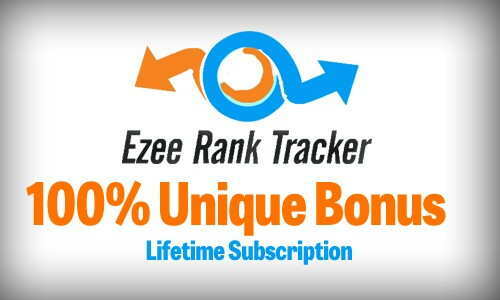 The Ezee Rank Tracker is the best rank tracking software as it gives precise and fast results. Furthermore, it updates you if there is a change in ranking. The software will send you an email to keep you posted. But this software is a bit expensive compared to other software programs. Though it gives you a satisfaction guarantee when it comes to the performance and offers an unlimited edition, it doesn’t change that it is expensive. You might not need to spend monthly for their service, but you have to buy proxies as it doesn’t have built-in proxies. If you don’t buy the proxies, you can’t use the software.